Lots and lots of real world, practical antennas you can BUILD YOURSELF! 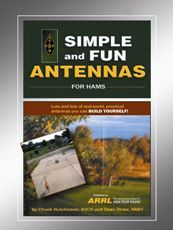 Simple and Fun Antennas for Hams is designed not only for newcomers to the wonderful hobby of Amateur Radio, but also for anyone overwhelmed with the theory and technical details in most antenna "textbooks." Too many books force you to "take a drink from a fire hose", when all you really wanted to do was to find some practical tips on how to build and antenna! Retired ARRL technical editors, Chuck Hutchinson, K8CH, and Dean Straw, N6BV, bring you more than 70 well-tested, fun and useful projects. Hundreds of photos and illustrations make sure you can actually build working antennas yourself. When you're ready for more, turn to The ARRL Antenna Book.